Cattle thieves in Maharashtra are increasingly aggressive, showing scant regard for laws and lives. Cattle thieves in Maharashtra break through toll booth barriers to run from authorities. Mumbai: Unfazed by authorities and self-styled cow vigilantes alike, the recklessness of cattle thieves in Maharashtra has peaked, animal rights activists have alleged. Ploughing through toll booth barriers, running over a farmer's leg and cramming cows and buffaloes in passenger cars, shows just how aggressive they have become in areas like Navi Mumbai, Thane and Raigad, say activists who have released alarming footage of cow thieves operating without inhibition. Earlier this month, cow thieves in Navi Mumbai ran over 58-year-old Vasant Satwi's leg when he tried to stop them from stealing a cow in his village. "I tried stopping their car but they sped up and drove over my legs. What will I do now?" Mr Satwi told NDTV from his hospital bed. The police and the administration haven't been very successful in stopping the thieves as they manage to wriggle out even after arrests. CCTV footage shared by animal activists with NDTV shows how cattle thieves get away by driving recklessly when they are given a chase. CCTV footage also shows how thieves pack cattle into passenger cars in the cruellest manner possible. "These people come in passenger cars and steal the cows and slaughter them. If in the meantime, any farmer or policeman tries to stop them, so they run the car over him. They hit him. Later they manage in court. Manage in the sense, they take bail from court," Animal Welfare Officer Chetan Sharma said. 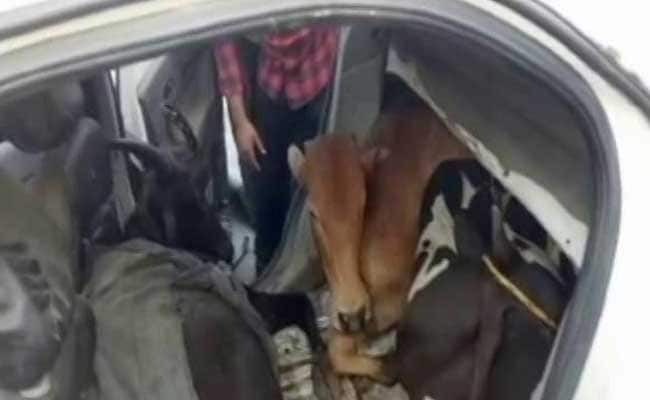 Cattle thieves in Maharashtra stuff cows and buffaloes in passenger cars. Activists allege most cattle thieves are repeat offenders but get away every time on technical grounds as courts grant them bail due to lack of evidence. "They do cosmetic changes in their names. Every time if you see the FIR, there are some changes in the name and address and everything. The entire record is not brought before the court to prove that they are habitual offenders. And that's how they easily get away," Advocate Siddhi Vaidya who represents People for Animals, said. Maharashtra's Animal Husbandry Minister, Madhav Jankar said, "Maharashtra government has made laws so that cows can be saved. I want to tell the cow saviours that whoever is real, the government will stand by them. But in the name of saving cows if they do several other businesses, then it becomes a little risky." Activists say that increasingly assertive 'gau rakshaks' or cow vigilantes have also driven cattle thieves to be more violent and the real cause of protecting animals from cruelty is weakened. "The reality of the cow and the perceived reality of the cow in today's India is extremely different and this work is extremely difficult. With the atmosphere, the way it is today it is just becoming more and more difficult," activist and Lawyer Ambika Hiranandani said.